Not what they used to be! Found a Minor in a scrapyard? Let us all know about it and exactly where it can be found. Called at one today. I used to go there years ago. All modern stuff, mostly looking like you could drive it away. Electronic stuff died, I suppose. And a few crash write offs. Useless for classics. Re: Not what they used to be! I take it that you are talking about a scrap yard? Yes Phil, hadn't been to one for donkeys years. Quite a disappointment. Most of the stuff is labelled up on a shelf. Ahh many a good day had removing parts from the car on top of two others! Where did it all go wrong? At least we had them days, before it all went silly. The best scrap yard I have ever visited and that was on a regular basis was Harry Buckland's scrap yard between Cheltenham and Gloucester. Over 50 years ago when I first started visiting to buy spares you would have found pre WW1 and between the wars vehicles just inside the gate on the left and the more modern stuff at the rear. A Daimler Landaulet fitted with a sleeve valve engine and which had bell codes for the chauffer to tell him what to do was parked up against the barn for many many years. I went there one day and it had all been swept away. Some good archive pictures on their web site. First place i took my wife was a scrap yard at Pease Pottage, for a boot light for her Midget. i remember getting quite a few Leyland bits for my Midget there too. Can't beat a colleague though - first place he took his future wife was Barry Scrap yard! We still have a few scrap yards around here in Somerset with cars 2 high where you do the dismantling. P.S. Once saw a sleeve valve engine on a stall being demonstrated...never really understood. One of my favourites was a good old-fashioned huge scrapyard tucked away down a woodland track in Chobham, Surrey. Used to find gems such as Lucas SFT576 fog lamps, etc. for my Minor. They even had such exotica as a burnt-out aluminium bodied Bristol Beaufighter, loads of old Jags, Rover P6 V8s, etc. (I got a decent V8 badge off of one). I've got good news for you - it's still there. What is - the scrapyard, or the Bristol? The scrapyard - definitely not the Bristol! I think it would be fair to say that perceptions of the worth of some previously unappreciated 'old crocks' have changed somewhat with the passage of time and the idea of anyone taking a Bristol, in whatever state of decay, to a scrapyard nowadays is beyond ludicrous. The value of hindsight, eh? Well, I was quite amazed to see it there at the time (must have been late 1980s), but it had suffered an engine fire, and there was considerable damage to the front of the aluminium body. I suppose it was probably an insurance write-off, as it would have cost an absolute fortune to repair. "...it would have cost an absolute fortune to repair." Well, with prices up to £300K now being asked for them it might just have been worth it! 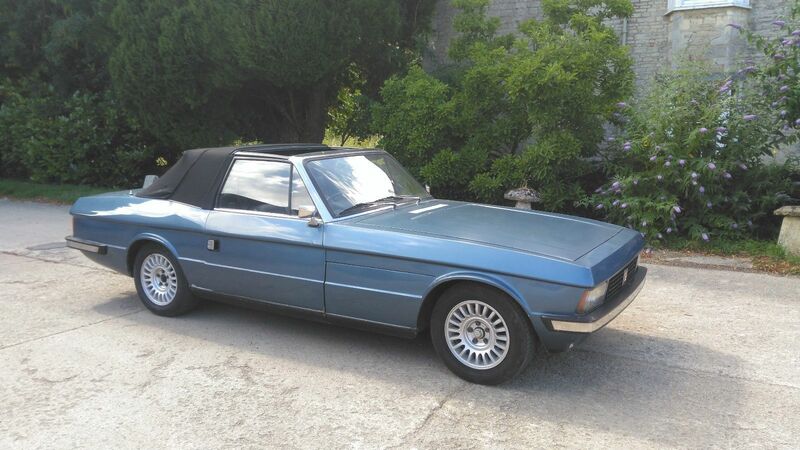 The Bristol used in the Inspector Lynley series looked like a brick on wheels , in my opinion !!! Give me a Moggie any day . I remember back in the late 40s or early 50s a scrap yard on the Leatherhead road in Chessington where the owner allowed my mate and I to wander round and sit in the various old vehicles including model A Fords and an old London transport bus but the best one was a second world war Hawker Hurricane fighter which sat on top of a couple of cars. I managed to climb up and sit in the pilots seat and for half an hour I was Biggles !! The yard is long gone it was turned into a filling station which in turn was demolished and is now a block of flats. There was also a good scrapyard in South Lane New Malden. Great memories. GavinL mentions the yard at Pease Pottage (Bridger's yard). Always used to be good. I went there in the late 80's without much hope of finding a front bumper for my Austin A55. Found one still attached to the rest of the car. Cost me a fiver IIRC. Had the number plate VYF17 attached (which I still have in the shed, five house-moves later). All it needed was half an hour's elbow grease and Autosol to revive it. Went back the next week and rescued some more bits off it too. Went another time in search of a replacement engine for my Marina. Expected it to be on the shelf in their engine store room. Instead they took me to the insurance compound. Showed me a write-off 40,000 mile Marina. Cut the front off with the oxy-acetylene kit. Fired the engine up to prove it was good, then pulled it out of the car for me. £75 bargain! In the late 70s the big yard near Croft circuit was excellent.Loads of 50s and 60s. Inside the big shed was the pre war stuff. All lost in a massive blaze in 1979. Also was a good yard near Leyburn but the owner was hard to deal with. In my own town I got a load of splittie bits off a car the owner didn't know he had. Included a complete set of windscreen trim! Fat chance of finding that for a fiver now!